Croatian Borna Coric denied Roger Federer the 99th title of his career on Sunday with a 7-6 (8/6), 3-6, 6-2 defeat in the final of the ATP Halle grass event. Federer also lost the number one spot in ATP rankings to Rafael Nadal, and missed a chance to earn a record 10th title at the German venue. Federer dropped the opening set in a tiebreak but levelled by winning the second. Coric held his nerve to take victory. The Croatian outsider ranked 34th also ended Federer's 20-match win streak on clay for Federer which stretched to June, 2017. The Swiss will drop to second in the world behind Rafael Nadal, who is playing no tune-up events prior to the start of Wimbledon a week from Monday. 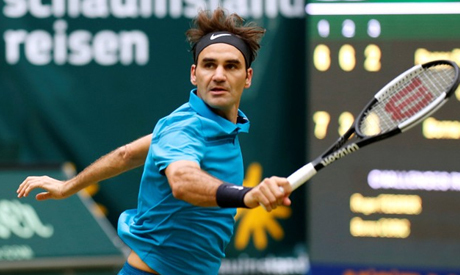 The loss in just over two hours means came a week after Federer won his 98th title in Stuttgart. The 21-year-old had lost twice to Federer, but played him tough in their last meeting at Indian Wells last March. He was the first Croatian to reach the final at Halle and now owns two titles after winning in Marrakech in 2017. Coric moved out to 5-2 and completed his upset on a second match point a game later as Federer's volley hit the top of the net. Federer's excellent serving in the first set - four love games, three points lost on serve - could not prevent Coric taking the opener in 57 minutes. But Coric annulled the first with a service winner while a wild Federer backhand accounted for the other. Second later, the Croatian seized the set on his first opportunity from a Federer backhand long. The 20-time Grand Slam champion fought back to level by winning the second set, helped by a choke on a volley from Coric. Trailing 4-3 and facing a break point in the eight game, the youngster raced to the net to flick over a winner on Federer's first set point, but stuffed the shot into the net. Leading 5-3, Federer squared the match in the next game as Coric hit the net again. Federer will travel to Wimbledon to put final touches on his grass game as he aims for a ninth title at the grass-court major.